NEW YORK, NY – October 5, 2015 – T.H.U.N.D.E.R. Agents, the landmark comic featuring the first truly international super hero group, celebrates its 50th Anniversary with a series of special announcements and groundbreaking news from respected Batman franchise Executive Producer Michael Uslan, Huayi Brothers Media Corporation, CEA Group, IDW, UNICEF and the United Nations during a Saturday, October 10 panel at New York Comic Con. After 50 years of protecting the globe, The Higher United Nations Defense Enforcement Reserves (aka T.H.U.N.D.E.R.) Agents still stands as the first and only truly international comic book super hero group set up to work for the United Nations. Brought to life in 1965 by comic book legend Wally Wood, T.H.U.N.D.E.R. 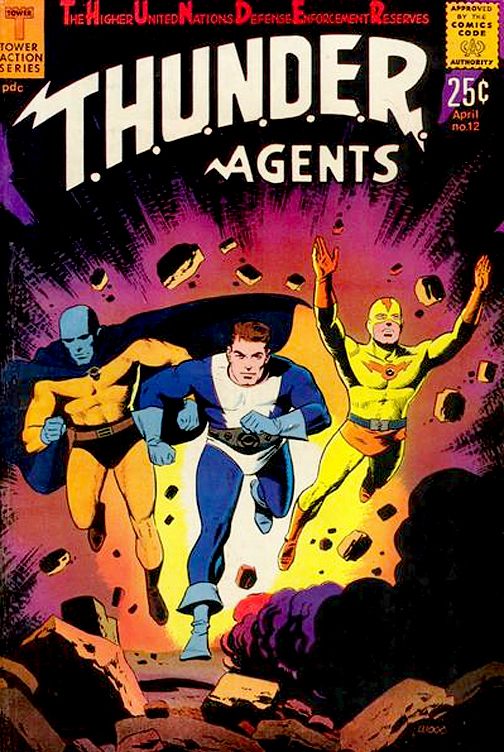 Agents has been blessed throughout its first half-century with some of the finest artists in the industry, including Steve Ditko, Gil Kane, Mike Sekowsky and Dave Cockrum. T.H.U.N.D.E.R. Agents’ message of global peace, teamwork and unity has even greater significance in today’s international climate. Panelists for the T.H.U.N.D.E.R. Agents celebration – which will be held in Room 1A24 of the Javits Center from 1:45-2:45pm – include Michael Uslan and fellow producer David Uslan; Olav Kjørven, Director of Public Partnerships, UNICEF; Maher Nasser, Director of the Outreach Division, United Nations; Sean Southey, CEO, PCI Media Impact; IDW President Greg Goldstein; renowned comic artist Bob Layton; screenwriters Ben Lustig & Jake Thornton; and surprise appearances by notable luminaries from the realms of comics and world relations. The panel will spotlight the history of T.H.U.N.D.E.R. Agents, and some exciting special announcements regarding the ever-expanding future of the franchise. In addition, the panelists will unveil new details of the benevolent United Nations/UNICEF initiative, “Comics Uniting Nations,” a partnership with non-profit organization Reading With Pictures to develop comics that illustrate the Sustainable Development Goals of the United Nations, and includes IDW Publishing’s participation throughout the world. All fans attending the panel will receive exclusive T.H.U.N.D.E.R. Agents gifts. Founded in 1973, CEA is a leading provider of investment banking services and private equity to the global communications, media, entertainment, and information technology industries. With a team of highly experienced personnel worldwide, CEA has an unequaled depth and breadth of industry knowledge, expertise and long-standing industry relationships. CEA has completed over 900 transactions totaling $45 billion in 60 countries. CEA and its affiliates also managed, co-managed or participated in a worldwide family of private equity funds with committed capital of approximately $1.15 billion for private equity investments in the industries CEA serves. CEA’s reputation and track record of success are built on delivering innovative, value-added solutions and services to clients worldwide. CEA Atlantic Advisors, LLC is a FINRA Registered Broker-Dealer and a member of SIPC. As a global organization devoted to the survival and well-being of children, the United Nations Children’s Fund (UNICEF) is working to create a world in which no child is ever institutionalized, bought or sold, stolen from a family or otherwise victimized. Created in 1946, UNICEF believes that every child deserves to grow up in a loving family and supports inter-country adoption when conducted ethically in accordance with prevailing law and best practices. At the same time, UNICEF works to support families in need so that no one ever feels forced by poverty or insecurity to give up a child. To focus on only one of those things, and not the others, is not in the best interests of children. UNICEF has helped save more children’s lives than any other humanitarian organization. HUAYI BROTHERS MEDIA CORPORATION is one of China’s largest and most successful media and entertainment companies. Founded in 1994 by brothers Wang Zhongjun and Wang Zhonglei, the company began with feature film production and distribution, and has since then expanded into television production, talent management, cinema, music, new media, gaming, and theme parks. After being listed on the Shenzhen stock exchange, Huayi closed a major slate financing deal in 2014 with Robert Simonds’ STX Entertainment, highlighting the growing business between Hollywood and China.